Gulfport’s core competencies in the fields of geology and geophysics have enabled Gulfport to secure first mover advantages in a number of North America’s hottest plays. We continue to be committed to establishing a culture of execution and are proud of the Gulfport team as its continued dedication has helped Gulfport become a leading producer in the southern portion of the Utica Shale and the SCOOP. Gulfport Energy’s core management and technical teams are comprised of proven oil and gas professionals, with experience and expertise in multiple regions including salt dome structures of the U.S. Gulf Coast and the Utica Shale in Eastern Ohio. 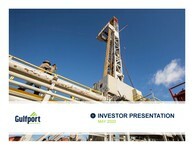 Gulfport Energy Corporation welcomes inquiries from investors, the news media, business associates and others who are interested in our company.